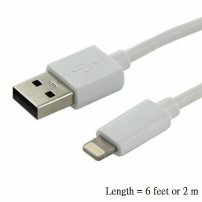 6-foot (2-meter) Extra Long 8pin Lightning Sync / Charge Cable for iPhone / iPod / iPad Air, Mini [AP003540-6ft] - $5.95 : allputer.com - Accessories for all your Portable Electronics & Computers! Ever tried using your iPad / iPhone / iPod Touch or talking on your iPhone while charging it in bed? Does your existing cable not reach your nightstand in a hotel room? Tired of the short standard cord? Finally -- a solution comes! With our new improved version of 2-meter iPhone / iPad / iPod cable there will be no more leaning close to your outlet. It is convenient, easy to use, and 100% compatible with the iPhones, iPods and iPads with lightning port. With high-quality and sturdy engineering, this cable is a must-have for in your home, car, traveling, and more. - Compatible with iPhone Xs, iPod Nano 7, iPod Touch 5, iPad Air, iPad Pro, iPad Mini, NOT compatialbe with iPhone 4, iPad 2, iPad 3, iPod Nano 6, iPod Touch 4 or earlier versions. - Improved Extended Boots and Study Cable is Strengthened for Use with Long Range. - - All brand names and trademarks are properties of their respective holders and are referred to here for descriptive purpose only. - 2 meters (or 6 feet) approx.